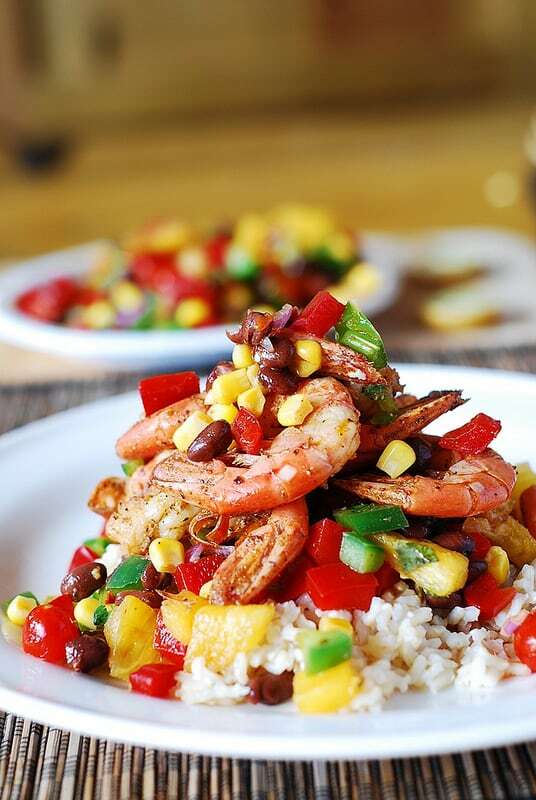 Shrimp with Mango Salsa and rice – easy, fresh, Mediterranean-style dinner that you can make at home! I’ve been working diligently this week on using up several pounds of mango I’ve had for about 2 weeks. They were not quite ripe enough, but now, after more than 2 weeks in the refrigerator, they are ready to serve their purpose! I’ve already made fish tacos, grilled salmon, seared black cod – all topped with tropical fruit salsa: I can be quite repetitive with my dinner choices. 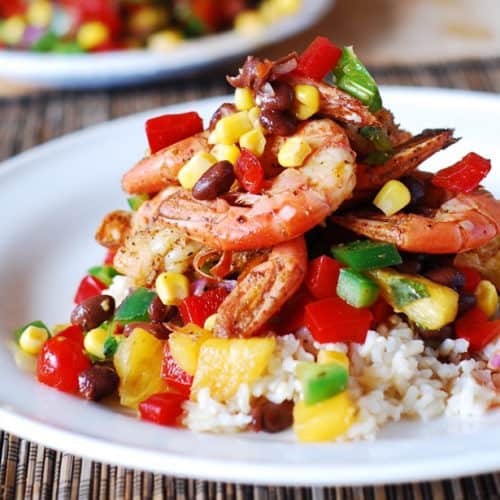 Oh well: once again I am combining seafood and tropical fruit to make this very colorful and fresh Summer dish: shrimp with mango salsa and rice! Tropical fruit salsa goes exceptionally well with all kinds of seafood, something I’ve learned in Hawaii. Making this kind of salsa is as easy as throwing together some fresh vegetables, chopped mango, pineapple or any other tropical fruit, lime juice, and some spices! You can sear the shrimp on stove top like I did below, or you could grill it using the same spices I am using in this recipe. Or, if you don’t have fresh shrimp, you can even use frozen cooked shrimp (defrosted). Because it’s so easy, I often make this shrimp with mango salsa after a long work day – it’s very comforting and quick! 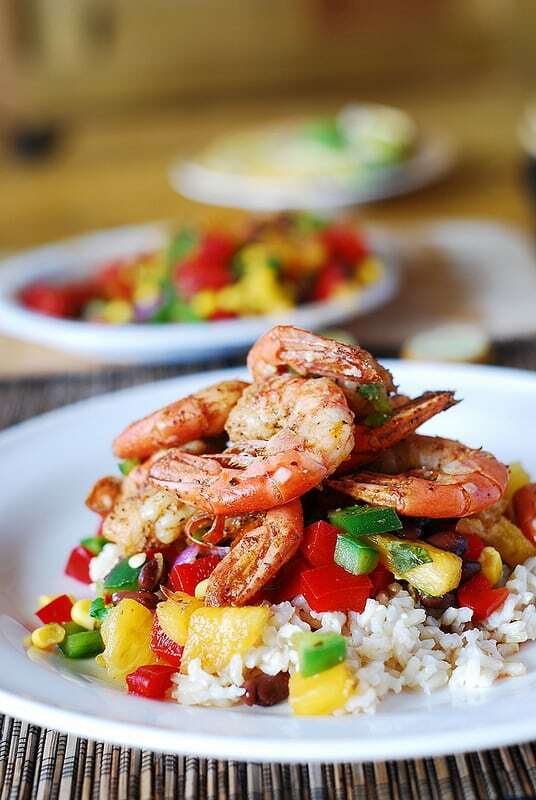 Combine seafood and tropical fruit in this delicious weeknight dinner recipe: Shrimp with Mango Salsa and Rice! Throw together some fresh vegetables, chopped mango, pineapple or any other tropical fruit, lime juice, and some spices! Mix all chopped ingredients for mango salsa in a large bowl, add lime juice, add salt and pepper to taste. Set aside to let the juices combine together. Mix salt, pepper, sage, paprika, oregano, cumin, and chili powder in a medium size bowl. Add shrimp to the bowl with spices and mix and toss to coat shrimp with spices. Heat 4 tablespoons of olive oil in a large frying pan on high heat. Add shrimp, coated with spices and cook about 3 minutes on each side, until shrimp becomes red in color on each side. Remove pan from heat. Add a small amount of cooked rice to each serving plate. Add a small amount of mango salsa to each plate. Top with cooked shrimp. Top with any remaining salsa. This is a wonderful recipe! Not only delicious, but so pretty on the plate that my teenaged daughter had to take a photo of her food! The whole family commented on how much they loved it. I will probably be making this at least once a month from now on. Thank you for this recipe! I saw those in the photo, too, but it’s not listed in the recipe. Yes, the bell pepper should be there! I just updated the recipe! Stunningly beautiful meal, Julia! 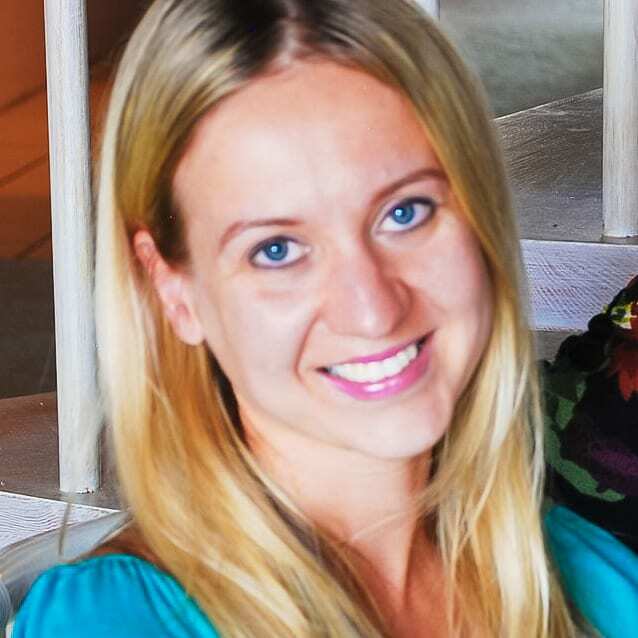 I am working on a recipe round-up post and will add a link to your recipe. Also, pinning!